Autism takes not 1 political party. Autism touches all parties. 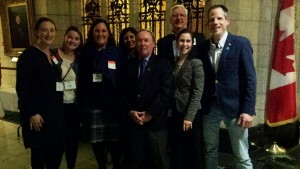 Dr. Hébert with the Honourable Mike Lake, Matthew Dubé, Member of Parliament, and the Honourable Carla Qualthrough Minister of Sport and Persons with Disabilities, and Canadian Senetor Jim Munson, among Autism self-advocates and supporters of CAP, the Canadian Autism Partnership, at the 2017 Canadian Leadership Summit on Autism. All standing for dignity and human rights for all Canadians living with Autism and disabilities. At the second national summit on autism in Ottawa on April 17 and 18 2016! 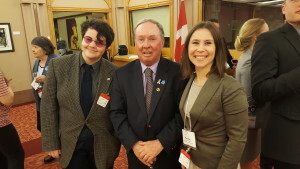 The Honourable Mike Lake, Senetor Jim Munson (photographed here), among several other politicians from different political parties, stand with leaders from across Canada to take another step toward change for all Canadians affected by autism spectrum disorders (ASD). This initiative exists thanks to CASDA. 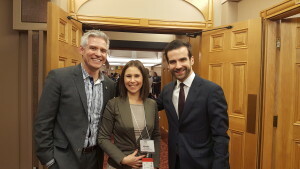 As a member of the Canadian Autism Spectrum Disorders Alliance (CASDA) since 2015, national leadership summit for children and people with Autism Spectrum Disorders (ASD), our organisation wishes to share with you a brief summary of the situation for Canadians who have an ASD (French text only). 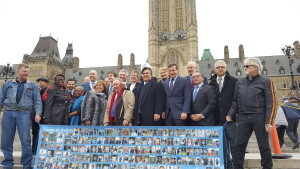 During a 2012 rally in Montreal Quebec, to increase public awareness about the growing needs of people with autism spectrum disorders (ASD), Dr. Hébert proposes national policy change to resolve the pervasive concerns about wait times in Canada. The Individuals with Disabilities Education Act (IDEA) in the U.S.A. is a policy to consider for the protection of the rights of our infants and toddlers with ASD. In a 2013 interview on Canal M, Dr. Hébert also shares a solution provided by Buds in Bloom© to reduce wait times for children with ASD, who need specialized resources. To listen to the interview, click this media file (interview in French).